About a month ago we got Baby Digger a new pool and she’s been obsessed with playing in it which is great considering temperatures have been consistently in the mid to upper 90s. We’ve also spent some time at our good friend’s house who has a beautiful in-ground pool. It’s about the only thing we can do outside and stay cool! I’ve started a collection of towels for her to dry off with when she’s all done splashing around. 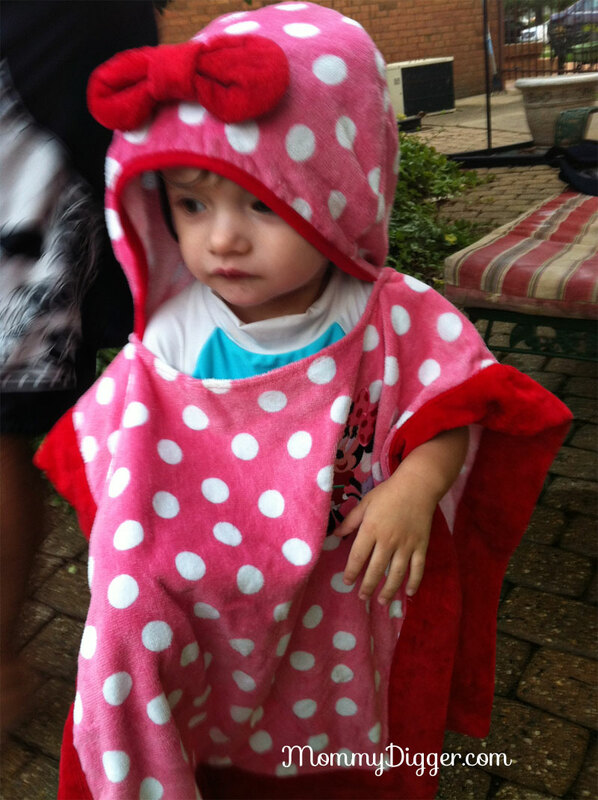 I recently had the opportunity to review one of the adorable towels from Disney Baby and I was overwhelmed with cuteness when I saw this Summer Infant Minnie Mouse Hooded Poncho towel! I love it because not only is it adorable with the little hoodie and pink bow but it can go over her head and she can wear it while she dries off. It’s in classic Minnie Mouse colors – pink with white polka dots and red trim and has Minnie Mouse embroidered on the front. She can also wear it as a cover-up when shes not in the pool or at the beach. It’s very soft for her sensitive baby soft skin too! That is just adorable! Thanks for the review. Oh my that is simply adorable! May have to look into these for next year! A towel poncho, what a great idea! My little miss flips over anything minnie mouse, she’d love this!